The extreme summer temperatures can take a toll on us. And on our cars too. It is, therefore, crucial to know how to tell when your car is overheating. Cars overheat, for various reasons. Most often, it has something to do with the coolant. The coolant circulates in your engine and is responsible for cooling your car. If coolant levels are low or there is a leak in the cooling system, it can cause your vehicle to overheat. If there is no leak and your car has adequate coolant levels, there may a broken part somewhere in the cooling system, obstructing the flow. Also, a malfunctioning radiator (often in the form of a broken fan or a clog) can contribute to the inadequate cooling of the car and hence lead to overheating. Sometimes, poor lubrication due to low oil levels can generate excess heat owing to friction between moving parts. The causes for overheating can be multiple, but some telltale signs give away whether a car is overheating. If you observe one or more of the following, you can suspect your car engine of overheating. 1.Steam (may look like smoke) coming out of the hood of the car and/or along with an unusual smell. 2. A hot hood. The hood would be too hot to touch in such a case. If you are unable to place your hand on the hood without burning yourself, for more than a few seconds, it could signal an overheated engine. 3. A high reading on the temperature gauge. This is often a clear sign of an overheated engine. 4. Malfunctioning Air Conditioning. If you suddenly find your car air conditioning blasting warm air, it can mean your car engine is overheating. 5. Unusual sounds. An overheated engine may also sometimes make “hissing” or other strange sounds due to anti-freeze leaking at a high rate and generating a ‘sizzling’ noise after coming into contact with the hot engine block. 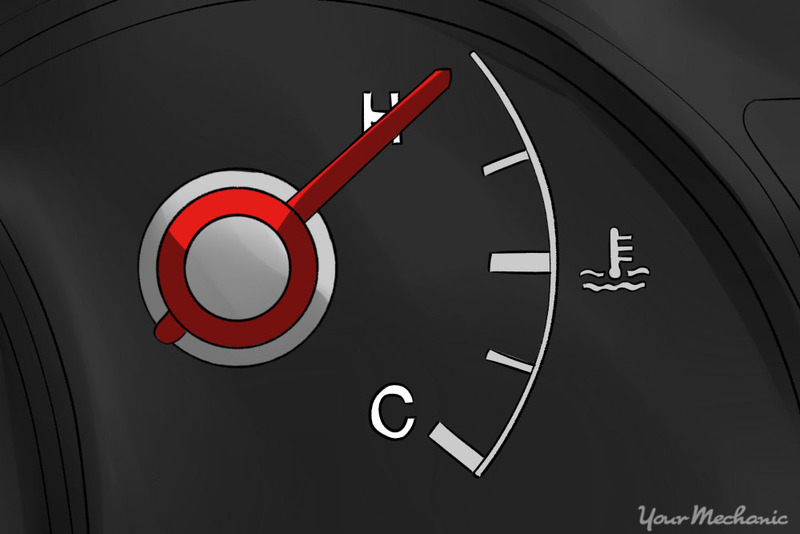 Once you have established that your car engine is overheating, turn off your air conditioner and ideally park your car. If you’re in traffic, put the car in neutral or park and rev the engine a bit. Always try to keep an extra bottle of coolant as well as water in your car. Usually, adding coolant would resolve the issue as engines often overheat due to low levels of coolant. In the absence of coolant, water will also temporarily cool the car. For more information on how to fix an overheated car engine, watch the video in the link below!